THQ Reveals Metro 2034 - In 3D! THQ has announced that a 3D sequel to Metro 2033 is in the works, creatively entitled Metro 2034. 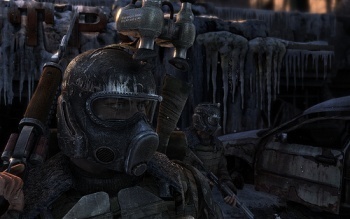 Developed by 4A Games, Metro 2033 is a classic Ukrainian shooter: Weird, bleak and tough. In other words, it was awesome if you're a fan of that sort of thing and a surprising number of people seemed to be, as the game racked up an aggregate score of 81 on Metacritic and, more importantly, turned into a money-maker for THQ fairly quickly. As a result, THQ Vice President Danny Bilson revealed, a sequel is on the way. "We're showing Metro 2033 in 3D right now, which Nvidia is showing as one of their key demo products," he told CVG. "We're going to be doing a 3D version of that on Metro 2034 - the sequel." Metro 2033 wasn't a huge, runaway hit by any measure, but it had something going for it that games like Halo and Gears of War simply can't bring to the table: It was cheap. According to Bilson, the sequel will be too, which is another reason why it got a green light. "There will be some engineering costs there, but that's in our lowest cost center in the world," he added. "Those games are unbelievably reasonable, they're built in Kiev." No word on when Metro 2034 will be released or what platforms it will appear on, but if it's made in Kiev it's a safe bet that the PC will be at the top of the list. Metro 2033 owners will be able to enjoy a fresh batch of post-apocalyptic Moscow subway shooter goodness in the very near future, however, as THQ is planning the release of the game's first DLC update, which will include new weapons, Achievements and the new "Ranger Mode" of gameplay, in "the very near future."